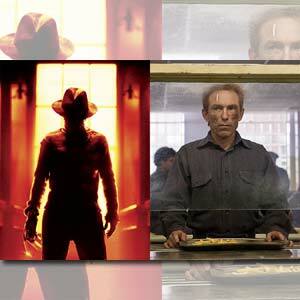 Jackie Earle Haley will star as boogeyman Freddy Krueger in the 2010 version of A Nightmare on Elm Street. Jackie Earle Haley earned an Oscar-nomination for his role in Little Children, and commanded even greater attention with his portrayal of Rorschach, the dark walking enigma of Watchmen. Now, Haley dons the bladed glove and grimy striped sweater as he plays the dream-lurking boogeyman Freddy Krueger in New Line Cinema’s A Nightmare on Elm Street, a contemporary re-imagining of the horror classic. "The first I heard that people were even thinking about me for this role was on the internet," says Haley. "And that was the fans, suggesting that I might be right for this role. My immediate reaction was, ’Hmm, that’s kind of cool.’ And then, when the producers called and actually offered me the role, I was flabbergasted. It’s such an amazing, iconic character, and just an absolute honor to be offered the role, and to get to play Freddy." "Jackie was the only choice," says director Samuel Bayer. "I’ve always been a fan of Jackie, a fan of his work in All the Kings Men and Little Children, but seeing him in Watchmen was amazing." "There are a lot of characters along the same lines as Freddy that are much less multi-dimensional," Haley notes. "They don’t hold a lot of interest for me, while getting to play Freddy was exciting and challenging because, as this mythical boogey man that we all love to be scared by, there’s a lot that makes him tick. There’s a lot of dimension to this guy, and it’s fascinating, maybe in a perverse way, but that’s what’s so interesting about the culture of horror films." Haley is particularly insistent that his predecessor in the role, Robert Englund, be given credit for crafting much of the dark charisma that Freddy has aquired over a quarter of a century. "It’s been a very cool process for me, trying to figure out how to make Freddy my own," he comments. "Robert did an amazing job portraying Freddy over the years. He made him who he is, an iconic, malevolent boogey man. What we’re doing with Freddy with this new approach is still trying to be true to those things that piss him off, the things that fill him with rage, and the specifics that make him the killing boogey man that he is—the fedora, the sweater, the glove. But I think we’re trying to capture him in a new way that’s a darker, and a little bit more serious, less jokey, and, hopefully, more scary." Haley has relished the process of crafting an all new embodiment of the nightmare-killer. "Freddy Krueger is definitely a fun character to play, just because he’s so not of this world—a guy that comes and stalks you in your dreams—he’s everybody’s worst nightmare. That, and the whole larger-than-life aspect of the character, is what drew me. I thought that this would be fun to play, and he really has been." "It was very freeing for me when I realized, ’Man, we’re playing a boogey man, your worst nightmare. This is the guy that’s the main point of focus in any campfire story. To me, that’s what A Nightmare on Elm Street is: a super high-end glossy ’E-ticket’ ride of a campfire story. Opening soon across the Philippines, A Nightmare on Elm Street is presented by Warner Bros. Pictures in association with New Line Cinema.